Have you ever picked up your iPhone to discover the message “iPhone is disabled” and to “try again in 1 minute” or to try again 5, 15, 60 minutes? In the worst scenarios, the message says “iPhone is disabled. Connect to iTunes”, and the device is unusable until then. So, what is going on here, why is the iPhone disabled? And how do you fix it so that you can use the iPhone again? The answers to these questions are usually straight forward, let’s review the causes of this message, and more importantly, the solutions to this so that you can unlock and re-enable the iPhone again for full use. Why is My iPhone Disabled? A locked iPhone requires a passcode or Touch ID to enter and access the device as a security precaution. 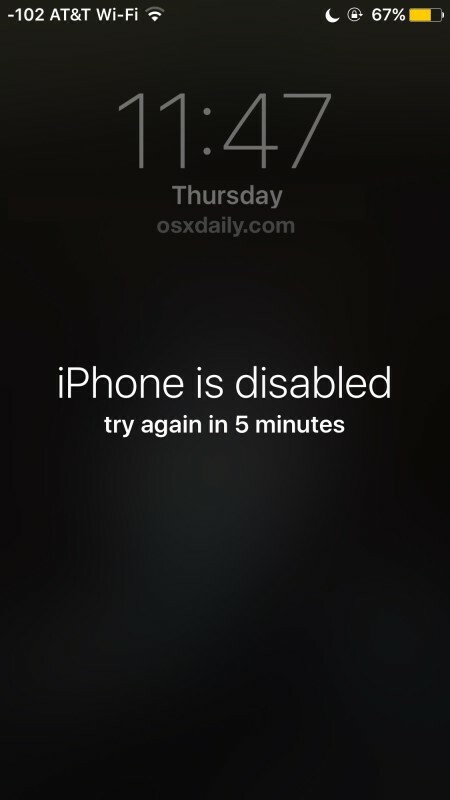 After the iPhone passcode has been incorrectly entered five times in a row, the iPhone will automatically disable itself for 1 minute, giving the “iPhone is disabled” error message on screen. The obvious solution in this case is to wait for the minute (or several) to pass and then enter the correct passcode to unlock the iPhone and get around the disabled message. In the future, just enter the proper passcode in the first place and you’ll avoid this message and the lock out period. Waiting a minute isn’t too bad, but waiting many minutes to an hour is inconvenient, as is connecting to iTunes to enable the iPhone again. Let’s further understand this issue to avoid it in the future, and going further we’ll show you how to get around the disabled message. But I didn’t try to unlock my iPhone, so why does it say it is disabled? In some situations, you didn’t actually try to unlock an iPhone and you didn’t (intentionally) enter a wrong passcode, but the iPhone says it is disabled anyway. How does this happen? The two most common reasons for an iPhone to seemingly lock itself out are pockets and people. Let’s discuss the two. The pocket disable: Inadvertently disabling an iPhone in a pocket is surprisingly common! This typically happens to iPhone users who keep their iPhones in a pocket that they also use for their hands, often hip jacket pockets, the hoodie pouch pocket, or front pants pockets for example. Because the iPhone screens slide to unlock feature can be swiped from anywhere on the screen, it’s fairly common to accidentally activate that screen, then enter into the passcode entry screen while the iPhone is a pocket with a hand or two, and perhaps unbeknownst to you, enter a passcode a few times to accidentally trigger the lockout. I’ve had this happen to myself while twirling an iPhone in a pocket out of boredom, and I recently watched a friend accidentally disable their iPhone while searching the same iPhone-holding pocket for money to pay at a food cart. This happens surprisingly often if you keep an iPhone in a busy pocket or put your hands in your pockets often. 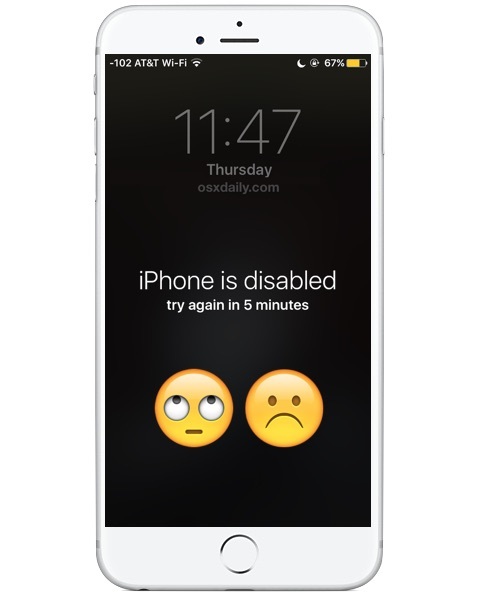 The person disable: There are two types of person interaction that can disable the iPhone, intentional passcode entry of someone trying to guess your passcode and then disabling it as they fail – usually a fairly obvious scenario. And the other type, the unintentional passcode entry, usually triggered by a young child. That latter scenario is extremely common with parents and caretakers with young children, who may fiddle with, tap on, and swipe around on an iPhone screen that is otherwise locked. The parent or caregiver often thinks nothing of it since the iPhone is locked with a passcode or Touch ID, but nonetheless the kid often finds a way onto the passcode entry screen (it’s only a swipe away after all), enters the wrong password repeatedly as they tap on the screen, and then the device becomes locked out with the “iPhone is disabled” message. Want to unlock an iPhone stuck on the disabled screen? You have to wait for the time to pass, then enter the proper passcode. If you can’t wait, or if you don’t know the passcode, you have to put the iPhone into recovery mode and restore it. Those are the the only two options. This is the worst scenario for an iPhone being disabled because it requires you to connect the iPhone to a computer to gain access to it again. Hopefully you made a backup recently to that computer, and hopefully you remember the actual passcode for the iPhone, otherwise you’ll have to erase the device and lose all data on it. Yes really. Yet another reason frequent device backups are important. If you don’t know the iPhone passcode, you have to wipe the iPhone clean and it will erase all data using recovery mode. The instructions on resetting a forgotten iPhone passcode are here. If you made a backup to iTunes or iCloud, you can restore it after the fact to that backup. If you do not know the iPhone passcode and you do not have a backup, the data on the iPhone will be erased and lost forever. There is no way around that, not even Apple can unlock an iPhone and access the data in such a situation. Thus, the lesson is don’t forget a device passcode, and always keep regular backups! How do I avoid iPhone being disabled from incorrect passcode entry in the future? To prevent this from happening in the future you have a few options. The easiest is to simply not enter the wrong passcode repeatedly, which will prevent the iPhone from locking up and disabling itself. Duh, right? Since that’s not always an option, another choice is to enable complex passcodes, since they require a longer character string be entered before the password is rejected. Keeping the iPhone in a different pocket, or out of reach of someone who is intentionally or accidentally entering passcodes is also a good idea. And finally, as we’ve already mentioned several times, always make regular backups of the device, just in case you do have to restore it to regain access. Know of any other useful information about a disabled iPhone, or how to get around the disabled warning dialogs? Let us know in the comments. Thank you for sharing all the possibilities for unlocking the iPhone after displaying ‘Phone is disabled’ message erroneously. I found the advice straight-forward, easy to follow. my i phone5s is also disabled.how can i get it back? i dont know sorry but can you help me? my i phone6 is also disabled.how can i get it back? If your iPhone is disabled, connect it to iTunes and enter the password to get it back and to stop the disable. Hey my iPhone 6 is disabled and i don’t have an computer but i have a chrome book and it still don’t work…. I also don’t have iTunes and i don’t want to go to the apple store to get it unlocked i want to do it by myself! Can you help me?? i was just wondering, say u disable ur iphone for 5 minutes…then u put in ur correct password and access your phone… after u put ur phone down and pick it back up and type ur password really fast to where its wrong will it disable again? no – it resets the cycle of incorrect passwords and will go back to giving you a few tries before disabling for the 1 min again. Wait, so if I can’t connect my phone to iTunes on my computer because I’ve never restored the iphone on the specific computer before, then EVERYTHING will be gone? So basically every information and games and the whole thing will be erased? And I have not connected to the computer before. Now it’s 2 months and I could not do it. Pictures of the best moments of my marriage and honey moon on the phone and I really do not know what to do. Please, everyone can help me. I’m going through this right now. None is working for me. My phone just will not unlock. Have you ever found out what to do mine is doing the same? My iPhone 4 is disabled and I can’t use iTunes. what do I do?!? Did you ever get a response to this? This same thing happened to my daughter yesterday. She did not attempt any erroneous sign ins. After shutting her phone down and restarting it, she saw the error message stating the iPhone is disabled and she must connect to itunes. She has no back ups to rely on and is hoping to restore without loss. Apple needs to get on this. Clearly it’s a problem. Is there any settings on iphone which can disable iphone wake up when it is inside pocket? Unfortunately no, and since Jony Ive and Co decided to make the entire screen swipe to unlock, as opposed to the direct swipe to unlock bar that existed with Forstall and Co, everyone accidentally unlocks the iPhone in their pocket all the time. Hooray for form over function! All joking aside, my Iphone has been disabled from the pocket on more occasions than I’d be happy with. My phone isn’t disabled but iTunes doesn’t see it.. Keeps telling me to update iTunes which is already the latest version. Well, I’ve heard a case where a father owns the iPhone of his recently passed son, and despite he has his thumb recorded with the Touch ID, once the iPhone has been turned off, the Touch ID does not work anymore and the iPhone requests the passcode that, unfortunately, this father ignores. The problem is that he wants to recover the last pictures he and his son took before his son passed, but he is unable to do that. This father called Apple just to hear that they are able just to recover the iPhone itself but not the data that will be lost. In other words, ok the privacy, ok the security, but what about a parent that would like to recover the last memories of his son? I think that Apple should create a “mater password” recovery system that only the parents of a minor can manage. Alex, if a parent wants access to a childs iPhone, they should have the passcode. The parent bought the iPhone, it’s the parents iPhone, they should have access to it. That should be worked out between the parents and children. Software should not be compromised to account for obscure scenarios because it will inevitably be abused by unintended actors or states. Any time a ‘master password’ recovery option exists it will be abused. It will not be limited to your case scenario. What would stop the iPhone being accessed in a divorce? What about an estranged partner? What circumstances are ok to access and not ok to? What would be stop the iPhone being accessed in a civil or criminal case? What would stop a foreign intelligence service from accessing all iPhones that way? What would stop hackers from finding the master password to access everyones iPhone they want? Nothing would stop it, that’s the point. You can’t create a hole in software and limit it, it becomes accessible to anyone with the means to discover it, which often includes some 13 year old hacker in some foreign country who wants to dig around in your personal documents for fun. The current case of Apple v FBI regarding the San Bernadino mass shooter iPhone is this idea in a nutshell. If that backdoor is opened, everyone and everything will rush through it, it will not be limited to the FBI for a single case because it can’t possibly be, who knows what other bad guys would find the same backdoor quickly and start using it immediately for who knows what purpose. That’s just how software works. It’s a Pandoras box you don’t want to open. Keep things secure. Once you start creating intentional backdoors in encryption it will be demanded for everyone, then suddenly your banking transactions are no longer secure. The iPhone disables itself to prevent abuse and hacking, it’s a security feature. Yep. This summarizes the reason for no “master password” solution nicely and how to avoid it with a child. And it is exactly what the FBI v. Apple is all about. And Apple is correctly fighting this precisely because it would both set a precedent and create a hole. Agree that there should be no master key for so many reasons, but do sympathize with the father and son issue. This doesn’t seem like a child thing, but rather an adult with an adult son. I wouldn’t expect the son (or my 38 year old son) to share his password with me. There are options for this sort of thing though, and it extends to numerous password/accounts that might need access. LastPass, a PW manager has a failsafe feature where you can designate trusted parties to be able to access your whole vault. In an emergency, or death, they can request access, and the request is forwarded to the owner. If there is no response in several days, the requesting party is let in. That gives the owner the opportunity to deny the request. You could also just put important PWs, PINs in a sealed envelope to be opened under certain circumstances. We have just lost our 37 year old son and apple says we have to get a court order for them to open it. This costs around £2000 so we have no chance of getting anything. My cat has fiddled with the phone and I’ve found it in the “phone is disabled” mode. Now I leave the phone face side down when I’m away from it as to not tempt the cat. Yeah, pocket swipe lockout is a problem. I’ve started using a sleeve, and I haven’t had a problem with a disabled phone since. I wasn’t keen on the idea of a sleeve, but I’ve gotten used to it now and hardly think about it. F Apple. I just had this happen and could NOT use my iPhone to call the hospital for my son who was stung by a bee and is allergic. Apple isn’t even willing to help stop terrorism in this country. Very sad. I am buying an Android phone tomorrow. Apple is sadly unAmerican and missing the boat. Cheers. P.S. – Luckily, my son is going to be OK.
Can’t anyone make an Emergency Call on any iPhone, disabled or locked or not? sounds like something a Patty would say. I got the “iPhone Disabled, try again in 60 minutes” message just as I hung up from a long phone call. No swipe, no password entry, nothing. What could be going on? I hope someone can answer this question, as the same thing happened to me this morning. I am guessing that my face came into contact with the number buttons on the phone while I was on the phone, which the phone registered as repeated attempts to unlock it. Hopefully someone who knows a lot about this sort of thing can say whether that is a plausible scenario. I had this today. Contacted apple to report what must be a software bug. 1 hour 6 minute call. Hung up. Ifone disabled 15 minutes. For the entire call it was sat on my shoulder. The screen wasn’t ever touched. I find the whole thing mysterious. No chance of mis keying a passcode, and besides, I’m on the fone, live call, why should it be locked anyway? You are on a call. You run into a problem and need to contact a family member urgently, life or death situation, you hang up your call to make that ‘non emergency services but a dire emergency’ call to find out you have to wait 15 minutes to do so. Meanwhile your child stands outside school because you can’t call your wife to tell them you are running late or the school to advise the same. Fix the issue Apple. I don’t pay hundreds of pounds for a mobile that self locks randomly. It would seem I am not alone in this going by this recent post. My phone died, I plugged it in to charge it, when the screen popped up it won’t accept my passcode and I am using the one I set up and entering it correctly. Assuming I’ll have to reset and lose everything? So I’m travelling through South America and as a backup my brother gave me his old phone. Didn’t realise after 10 incorrect passwords the iPhone would disable so tried 10 different ones over the lock out period (pass codes like his birthday and old pins). He recently gave me the password out of being out of contact for a while yet the iPhone is displaying the feared “iPhone disabled, connect to iTunes”. The issue here is that I’m miles from home and a computer the iPhone will recognise. So am I screwed or is there anyway I can fix this issues? Can I use anyone’s computer and iTunes to simply wipe and reset the phone? (Just want it for photos to take out on nights out or dodgy areas where I might loose it or get mugged). It’s an old iPhone 4. Any help would be greatly appreciated, cheers guys! Yes you should be able to connect the iPhone to any computer with iTunes and reset it, it will clear the device though by erasing everything on it, that’s the big issue, and you will need the proper passcode of course. Good luck, and enjoy your travel! Sorry to correct an otherwise fine article, but there is yet another way. 4. the iPhone will then start up again in the Setup Assistant, and you can either set it up as new or restore from a backup. This really works. I was able to restore from the cloud. I don’t have a passcode so I don’t know how this got locked but this fixed it. My iphone 6s is not recognizing my pass-code and I know I’m using the right pass-code. even its not recognizing my finger prints. How can I get it back. Same thing has happened to me. I tried to download Itunes on my realy old computer but it wouldnt, since it is not updated. Now im in a huge mess of what i should do. My ipod says it’s disabled try again in 25,458,128 minutes. I’ve never seen this happen. What could be causing this>? Also, I’ve hooked it up to iTunes and it says it has 4hrs remaining. Does it really take that long to fix it. It explains why this happens and what you can do about it. You can also authenticate with iTunes. Phone says it is disabled and connect to iTunes. I connect to iTunes and a box pops up saying “iTunes could not connect to iphone “iphone” because it is locked with a passcode. You must enter your passcode on the iphone before it can be used with iTunes”. Well I cannot unlock it because it no longer gives me that option. What do I do??? and mine is the same with lara. That still does not work. Mine is doing the same thing! i cannot get it into itunes because i dont know the password on my phone which is exactly why im trying to get into itunes…making me crazy did yall ever figure this out? Good advice! You should also let others know if they restore a backup, that passcode they forgot may well be on the backup too, creating the same issue again. my iphone 5s was disable due to its screen stuck.will i need to repair the screen first ?we have no apple store,could u give me any advice? my ipad air 2 is disabled says try again in 26 years and it won’t let me use find my iphone app on another ios device to erase it sayi it will come and do that next time it comes online and don’t have a computer and no apple store nearby what to do about it. Just wait for the 26 years dude. My iPhone 5s got disabled due to my brother and now that I have restored it, I need some contacts off it. I don’t have the PC to which the iPhone is synced and I restored it using my laptop. How do I get the contacts now? Is everything lost? I reallllly need the contact. It’s very important. The iPhone was backed up on the PC a couple of times and I don’t know how I can actually get it on my laptop. I’m in an other country and the PC’s back home. I don’t know what to do. Please help. I tried finding the file on my PC using TeamViewer but, is there anyway I can connect the iPhone to the iTunes on the PC through TeamViewer even though I’m staying in an other country? I bought a iphone 4s from somebody online it says its disabled is there any way of undisabling it to a computer it.hasnt been synced.to??? You’ll have to restore it using iTunes. When it does restore, it becomes a new iPhone as it loses all of it’s data and files. But at one point during the setting up, it asks for the Apple ID used to set up the iPhone when it was first bought. For that you need to know the Apple ID and Password of the seller. This is where I’m currently stuck. My little brother disabled my iPhone and had locked my Apple ID. Hi, I have iphone5s, I never connect it to any computer ,now unfortunately it get disable I want to know how to make it restore? Hi, I bought a I Phone 6 on Facebook and I tryed to get it to work and it says iPhone is disabled connect to iTunes. I don’t have any special codes or anything. My first apple idem. I’m a newbie to smartphones. Never used an apple device B4. My Mother got two free iphone SE’s via Sprint along with a 2yr contract. The phones were free with the plan offered. Well. I don’t like reading directions – from a book. So, began working with the new phone which walked me thru the new phone setup. I mapped in my thumbprint and entered another 8 to 10-passwords and answers to other security questions. Such as your favorite pet’s name, your school, friends, etc. I looked thru the phone fiddling with the camera and video. Looked thru the settings. All I REMEMBER changing was text size. I did not call anyone or add any phone numbers. Nor did I download anything or go to any websites. In fact, I never found the App Home Page. It gets late and my brain is fried, I put the phone down and go to bed. When I picked the phone up 10hrs later. I thought at most. All I’d need to do is use it. Was apply my thumbprint. Instead of asking for my thumbprint. The phone said it needed my Passcode to gain access to my Thumbprint. WHAT?? How the Heck does a passcode surpass your Thumbprint in being more secure?? Anyway. Long story short. I’m locked out and told to use iTunes. If I do use iTunes. Will this new phone’s memory be wiped? Will I lose anything?? Such as the Apps already on the phone?? I only took a few pictures, which I do not care about. Points here. 1) This phone is new and should know there is nothing of value on it. 2) Before disabling the phone. Why wouldn’t supposed advanced technology at least ask me one of the other security questions I entered? Zaedasht, put your iPhone in recovery mode and restore it. I forgot my iPhone passcode. It is now disabled. I went to the Apple Store and they told be they can’t do anything other than resetting the iPhone ( which will erase everything). They said Apple is not doing any passcode recovery incase it is a stolen phone. But the phone is mine. And it has my apple id, credit card number etc. I can prove that its mine. Please help me, I don’t want to lose my stuff. Go to Apple Store with your proof of purchase showing serial number etc, all of your info, then ask if they can reset the password for you. In the future, do not forget a passcode. It is impossible to bypass the passcode in most situations, that is the entire point of encryption. Otherwise someone could steal an iPhone and then decrypt the passcode and bypass the disabled iPhone, access all data, sell it, etc. Doesn’t sound so good, right? I don’t want to loose anything, I’d give anything to be able to access those photos. Wish I stopped trying passwords when I knew it would go into disabled mode as soon as I realized I forgot the new passcode I changed during the trip. You can still plug in to iTunes to see if it allows you to back up without entering passcode (auto sync). Unless you could remember the correct passcode, even if its not in the disabled screen the only option is still resetting your iPhone. Apple don’t care if we lose our stuffs, they make sure that there is no possible way for anyone to get your data (through encryption). which is good, but definitely not the best solution for people who don’t back up their phone for many reasons. I just wish they that they make it mandatory to back up our phones or they remove the stupid 10 passcode attempt rule (which they never made it clear). I hv iphone 5s…it has icloud lock..i try to open lock via itune…bt my computer accept cable,bt the itune apps cant find the cable…what can i do now???? Nothing works. I have tried everything that I have been able to find for the past 3 days. Unable to detect the phone when plugged in. Unable to connect to iTunes. Unable to restore. Unable to complete the master restore. Just locked for 24 million minutes. I have really learnt to hate apple products. Charged ridiculous amounts for every small feature/gadget. Having to go and find one of the stores to able to fix a problem that appears to be common is just irritating. Connect to iTunes. .I have no iTunes or computer to plug into. . What do I do? ?? ?to reset an use my ipod? ??? Your iPhone Plus is disabled, and what? Follow the instructions here on this web page, it fixes iPhone is Disabled message. I have had to fix my iPhone with it, it works fine. I let a kid fiddle with mine, and thought the data would be safe since I turned off the auto erase feature. I know my password, and my login, but I didn’t back up because I just use it (4s) as an iPod since I got a new phone and therefore only have games and pictures on it. Even with all the login and passcode, is there really no way to save my pictures once it gets to “disabled, connect to iTunes” ? If so, the ability to turn off the “self destruct data” option creates a huge false sense of security and needs to come with a disclaimer. emily, the iPhone is disabled until it is connected to iTunes and the passcode is entered. The data is still there on the iPhone. The data is not removed if you do not have the self destruct feature enabled, the iPhone is just disabled as a security measure until the ownership can be authenticated. Read the article to learn more about how to resolve this, it is a matter of connecting to iTunes and entering the passcode, that unlocks the iPhone and re-enables it again – that turns off the “iPhone is disabled” message. So I have an iPhone 5 disabled n tried to erase it that way^ signing into the find my iPhone n managed to get that far but the thing is the phone’s wifi is not on? It says it’s got no service? When it should say bell idk please help! Mine says disabled for 3,835 minutes….. will have a go on iTunes… or I could just wait…. My solution is very simple. I just don’t lock my phone using a password. It simply isn’t necessary. I use my laptop for business transactions. I only use my phone for phone calls, texting, taking photos, the map function when I’m driving, other simple stuff, but nothing important that could cause a security risk. If some stranger gets to look at my photographs and also see what friends and family are on my contact list, then I don’t really care. I don’t have anything secretive on my phone. In fact, if I’ve lost my phone, then maybe they’ll call one of my contacts to try to return it. My son disabled the iPhone somehow, I don’t have a computer to sync it to iTunes. Never have. So now what do I do ?? My iPhone is disabled and gives me message to connect to iTunes. After connecting the iTunes and make the recovery mode it gives me message that there’s no enough space. How can I erase data while the iPhone is disabled? My iPhone 5s was disable with connect to iTunes by my 18mo old daughter. I know the passcode to the phone but have not backed it up since before she was born (2yrs+ since) and I no longer have the laptop it was last synced to. The hardest part is losing the pics from her birth to now. PLEASE Help!! Is it at all possible to get it open without deleting all my pics? Yes, wait until the iPhone is Disabled time runs out and you can unlock it with your passcode without losing anything at all. 5 minutes, a few hours, etc, it will tell you on the screen how long the iPhone is disabled for. The iTunes method makes it faster. Take it to an Apple Store too they can help. I have a HUGE problem. i had my phone OFF “set automatic time” and my little sister was tyring to unlock it. After i got back to my phone and it was fine but i went to settings and turned it ON to “set automatic time” and suddenly it said IPHONE DISABLED COME BACK IN: 1 MONTH, 5 DAYS AND 52 MINUTES!! Can anyone PLEASE help me i do not want to erase my data because i have very special photos on there! Someone please help!! My iphone is disabled for 1 minute but then before the time ended it resetted by itself. Now everything is gone. How could this happen? My I phone 6 plus is disable with a message ” Phone is Disabled” Connect to iTunes. When I am connecting with iTunes in my PC a message appearing that your ” iTunes could not connect to the iPhone ” iPhone (2) ” because it is locked with a passcode. You must enter a passcode on the iPhone before it can be used with iTunes. So I would like to know how I can enter the pass code on a disabled iPhone? I have the message: iphone is disabled. Try again in 24,495,166 minutes. What can i do? Sir I got an iPhone in seconds . I don’t know it’s Apple ID and password too. And now it’s blocked . How can I unlock it , is there any possibilities.. Please help me.. Your iPhone can get disabled if the screen gets damaged. As this will cause the phone to auto type incorrect pins. To avoid this I suggest that the phone be turned off at all times till the screen is replaced. my iphone is been disabled and it shows that i have to wait 3200 minutes….can i be sure that after this minutes count out my iphone will come back the way it was? How can I get into my iphone4 when it says disabled connect to itunes . ?I forgot the passcode to it. Then you can do it! conect to iTunes it says what shal i do? I don’t remember the password. How do I delete everything on the phone? I’m on Itunes but don’t see any buttons to delete. I still want to get on the iphone. I am trying to backup my iCloud on an old phone. It’s an IPhone 4s. I haven’t used this phone in over a year and just remembered some pictures I would like to get off of it. I have now locked myself out because I couldn’t remember the password. Is there anyway to backup this phone without having to connect to a computer & save the pictures/videos that are on it? I have an iPhone 7 and I don’t remember the password to the icloud and it’s disabled and when I tried to reset it. It said please enter the icloud info? Hi I have a iphone 6 which is disabled. I Brought it off ebay (AWFUL MISTAKE) with the accessories. But when I received it it said iphone disabled connect to iTunes. I contacted the seller about the apple ID and codes but no response. I’ve also contacted ebay due to this issue. Back to the important question…..what do I do now. I don’t have the codes to restore the phone through iTunes. Do i take it to apple for them to see what they can do. Can they even do anything? I couldn’t care about the data on the phone as it’s not mine, so that can be lost. but I need the phone itself…….someone please help me!!!!!!! You can connect to iTunes and enter the proper passcode to unlock the device. If that does not work, your best bet would be to contact Apple, perhaps visit an Apple Store. They might be able to help you unlock the phone. Once the iPhone 5S is taken back to its original factory settings can you start over again? Hello! If your iphone is disabled and you must connect to the computer, and if you know the passcode you must to power off your iphone. You must open the phone and you will see “try again in X minutes. After X minutes you can write the correct passcode and open the phone. My iphone 5c is disabled and says to connect it to itunes. I do so, and it asks to allow my laptop to access my phone, I say yes. Then, it says to allow access please respond to your iPhone. I can’t get on the phone cause its disabled what do i do? What does I tunes locked mean? Can I bypass this? I know my passcode, but it says connect to iTunes. Will I have to restore the newest backup or can I unlock it from there? My 5s is disabled. No backup. No itunes . Passcode lost . This feature is not user friendly at all. If there is a ‘self destruct’ option, then by default it should be off and let people decide for their data how to be treated in case iphone stolen or lost. The disabling is absolutely frustrating!!! Alternatively, Apple should create a registration process to track owners of an iPhone and as long as a phone has a clear ownership history, provide ways to give the access back! You can search the related unlock iphone topic in Yolisoft.com. Do not miss any chance of solving this problem. Hi so my friend continuously typed the wrong password on purpose and now it says iPhone disabled connect to iTunes. well i did and my computer says that the value is missing. What do i do?! How can I “Trust this computer (Macbook pro, Ei Capitan 10.11.6)” if iphone5 S is disabled? Is there a way to disable this requirement without restoring the phone? Is there a software that could do it? My I phone plus was disabled and touch error and I touch No.0 but it response No. 2. How can I resolve it and how to prevent for further disable. Please. My i phone 6 plus had the disable try again in 4 min after i changed the screen, don’t know why it did that but it did. What i did was i kept turning the phone on after the screen went off (note i did not tell it to power off) the screen came back on with try again in 2 min then in 1 min i did this several time and finally it came on like it should. Don’t know if this will work for everyone but it worked on mine. Worth a try for some. This is again Vic again what i have learned is if you do get into your phone then go into your settings and turn off your phone locks if you can but you will need to know your pass code to do this from what i can tell. For all of you that read my post you are doing this at your own risk i’m not a phone tec or wizzee, so i will not be responsible for anything that may happen to your phone. i dont have an icloud account ive never set it up. i forgot my passcode to my phone. if there is any way possible for me to reset my phone without icloud let me know. i dont even care if it deletes everything. please !! i need to get back onto my phone !! What if you haven’t synced your iPhone to any devices previous to it being disable? My Iphone4 had berm disabled like 3months ago and I don’t know what’s wrong with it.i can I solve it without iTunes or any computer. my iPhone is disabled and I don’t have apple laptop to connect to iTunes. please help me so that I can use my iPhone again. How could I open my iPhone 4s if it is disabled for 24 million minutes? My iphone display a message. Ipad disable connect to itune, and no time giving to me. I still can’t unlock my iPhone, pop up appear on iTunes that must enter passcode. So, i use recovery mode to clean install my iPhone but after success, still error with this message “Couldn’t Activate This iPhone”. My iPhone 8 has been disabled for 6 months now. I do not want to restore it because my data will be lost forever. Is there a digital forensic company we can pay to recover our data? I have not synced and set up an icloud account, my bad. Please help. Clean your screen, or if the screen is damaged you need to get the screen replaced. It sounds like your iPhone is disabled because of screen damage or screen gunk that is activating the touch screen improperly. What happens if your phone is disabled for 24,742,468 Minutes?! I finally found my long lost First generation Iphone and i found it like that. My iPhone was disabled for almost 1 day. What can be done if I don’t have laptop to connect itunes. Do I have to wait for how many hours more . I was given an iPhone SE and it was already on the disabled connect to iTunes…i have looked up many different ways but they all say to connect to computer…i don’t have a computer an I wasn’t given the passcodes to anything so I can’t use itunes or icloud on a computer anyways…how can I reset my phone to bypass the message? This is enough for me to switch to a android of some type. I’m big looking for a security device. I just want a phone!! Sheesh!!! My iPhone 4 was disabled and says Connect to iTunes; with red banner; it also has a message saying activation may take some time. Apple tells me that if I plug it into iTunes it will wipe my computer and all of my previous photos of my baby!!!! I don’t recall backing it up except perhaps when I bought my iPhone 6. I am just beside myself losing the most precious photos of my son that I entrusted Apple with!!!!! I think a Class Action is in order to compel them to give us back access to our previous data! My husbands phone is disabled due to myself and law enforcement trying to open it when he was found deceased 😰 I found out the only way for Apple to get it back working is to clear the phone back to the way it was like the day we purchased it less than a year ago. It’s the IPhone 8 and I don’t want to lose the pictures of my beautiful husband and family together that is in his phone. Apple employee gave me a business card for a company that I called that can unlock the phone without any loss of anything on the phone which is fantastic!!! But it cost $3600.00!!!! I’m sorry but I can’t afford it so I’m going to search for another company or person who can do it…there must be others out there. Hi, my phone says “iPhone is disabled connect to iTunes, and I have a passcode on my phone (iPhone 6) I didn’t do anything to disable it and I have had it for less than 6 months and I cant get it to work – no sync cables are working – it isn’t connecting to the computer and I have tried different cables and computers. I have a iPhone 6 that is disabled and needs to connect to iTunes, it has a passcode. the problem is that the sync cords wont connect to any computer. it is less than 6 months old. please help. Please my iPhone 6plus is disabled and it said to be connect to itune please what method can be best suited for it please because am in need of my phone and I have forgotten the password. ive connected my iphone to the computer but i need to press trust on my iphone for my laptop to recognise my phone but my phone is disabled, what do i do please help?! First off I want to say that never ever buy an iPhone, other Apple products are fine but never use iCloud or Apple account. Now to answer your questions, you cannot restore/recover an iPhone if icloud was enabled and you forgot everything. You can remote wipe and unlock your iOS with apple account but your phone needs to be online. To restore offline, boot up iPhone to recovery mode with combination keys and connect to iTunes on a pc. Choose restore and update. A new software download should start and your forgotten password shall be removed along with all user data. It will reset to factory settings. Congrats! Don’t forget to switch to android. Even if you forget your passwords. You can revive your phone and recover all the data. my iPhone is disabled and I cant down load iTunes what should I do.